Growing up I was always tinkering and building things which has led me to doing an installation here or there when the opportunity arises. Below are a series of pieces that I designed and my dad and I built for various events in Chicago. After road tripping down R66 with Soho House Chicago and 10 other Chicago artists, I had the duty of creating a series of neon signs for the R66 NYE party. Unfortunately, in the hustle that was creating and installing these pieces, I have no personal photos to show. However, thank you to all those who posted on social media and allowed me to use their photos to show my work. First was a doorway inspired by the Peggy Sue Diner (above). By layering pieces of flat plexi and adding colored gel overlays, we were able to create a giant juke box to call out the entrance to the diner within Soho House Chicago. During our trip we visited the famous Blue Swallow Motel and I created a Grey Goose inspired version to hang at the event. At almost 12 feet wide, the sign was created using laser cut MDF, an acrylic veneer, and was finally outlined in various colors of EL wire. A Mobil Gas inspired sign was created using the same method. And finally I also created an EL wire cactus. The neon church was constructed for one of our shrub events Help I'm Alive: An Existential Crisis Party, referencing the fact that many people begin an existential crisis in the wake of leaving the church. The structure is made of EL wire strung along a framework of hollow metal tubing. The steeple can also be removed to create a house effect, as seen at the Chicago Athletic Associations 2016 Halloween party. For Lollapalooza 2016, Culture Collide magazine and Twix teamed up to produce a show for Dinosaur Jr. at Hard Rock Cafe. The pitch was to use EL wire to create two pieces for Twix, emphasizing the "Left Factory" and the "Right Factory". After a few different concepts we landed on a literal "Right" and "Left". One vertical and one horizontal. For their launch party in 2016 the Mill wanted to create a neon inspired installation for the roof. 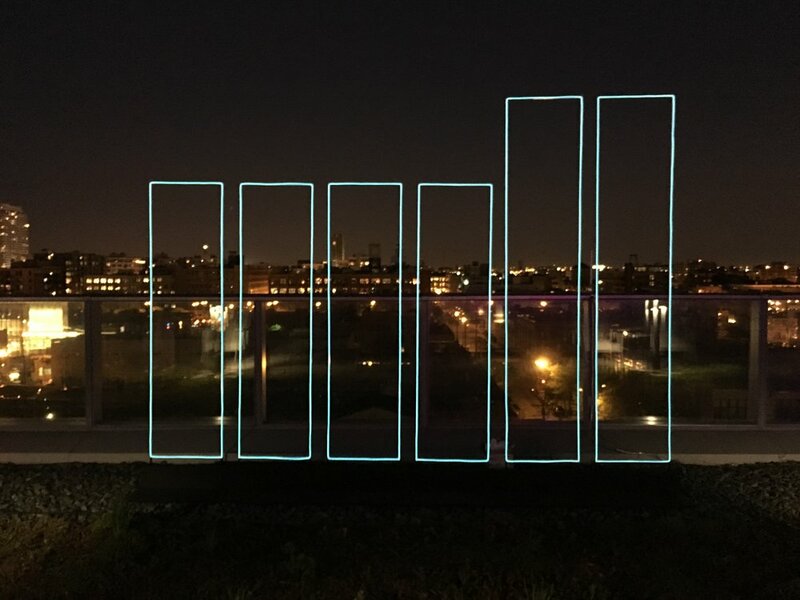 Eventually we decided the most impactful execution would be a version of their logo in EL wire that also allowed you to look through the logo, out into the city of Chicago. They also wanted to use the installation in their office after the party, so I created some IKEA-esque instructions so they could easily disassemble and assemble it again themselves. From what I understand, it can currently be seen in the office kitchen.